Hi everyone! As I sat here today at looking outside all I could think of was the snow storm that we were in the midst of. The ice is the worst part and thank goodness it's almost over. While I was looking outside I happened to see a cardinal sitting on a tree branch. I also saw animal tracks through my back yard going into my neighbor's yard, I think they were rabbit tracks and so that was the inspiration for today's card. I started my card by first stamping the tree image and then I proceeded to stamp the snowflakes. Some of my snowflakes are stamped lighter by inking up my snowflake stamp and then stamping off onto a scrap piece of paper and then stamping the snowflake image onto the tree. Next, I added the red bird (be sure to use your stamp-a-ma-jig to help align the images better). To create my snow along the bottom I simply took a scrap piece of card stock and I tore it along the edges. Then I went along the edges using my 2 way glue pen and I lightly dusted on some dazzling diamonds glitter. I did that for both layers of snow and then once they dried I adhered them to my card. I stamped the deer and bunny images onto another piece of card stock and then I cut them out and placed them on my card using a dimensional behind their heads and their feet are tucked down behind the snow. I punched the top part of my chocolate chip card stock layer using my scallop trim border punch and finally I decided my card still needed a little something and so I decided to add a small bow in the upper right corner. Well, that's about it for today. I hope you liked my card, it was hard to get a nicer photograph, but it's really glittery in person. Stay warm and be safe in this ice storm! See you tomorrow! 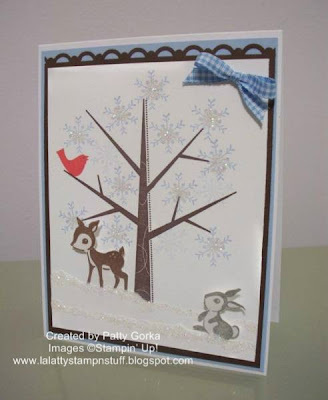 Beautiful card Patty, love how you combined these stamps, that is very creative of you :). Really cute! Love the cardinal! Very pretty card. I love all of the scene accents you have added. Absolutely adorable. I love the Forest Friends set! It reminds me of Bambi & Thumper. :-D Love the snow! Great card! Excellent job on this card!